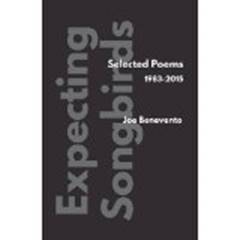 The question I have about Joe Benevento’s very likeable new collection of poems is why he chose to name the volume with the hopeful title, Expecting Songbirds. It’s the title of a poem selected from his 2003 collection, Willing to Believe. Was it something as simple as just liking the way it sounded? But knowing Benevento, an English professor, it must be emblematic of something in the poetry that he wants to highlight. But what? Expecting Songbirds is a collection of new poems and poems selected from four previous collections, poems spanning a third of a century, 1983 – 2015. We get a good sense from the voice exactly who this Joe Benevento is. Full of a cautionary nostalgia for “where I grew up, South Jamaica, Queens … the last white boy left, praying / for amigos on streets owned by Dominicans and Puerto Ricans.” (“Mango Street Rules”), Benevento is to his corner of New York what Philip Roth is to Newark, remembering the vivid details of the Lefferts Theater on Liberty, Bruno’s Barbershop, the Q41 bus his mother took, Freddie’s Fish Market, the subway ride from Richmond Hill to Bay Ridge, and a whole cast of characters from Junior Normandia, Judge Franklyn, Jorge Irizarry, José, Fernando and Ricardo to the unforgettable Sylvia Ramos. While Benevento has lived his entire adult life in the heart of the heart of the country, Kirkland, Missouri, he takes us back to the desires and conflicts of youth as if he were still a teenager. to cash in on that crush. away for my own good. “Who Names Their Kid Brandi?” (Tough Guys Don’t Write) and “The Bachelorette” (My Puerto Rican Past) are two others that raise a smile or a laugh. There are also a couple of really admirable sonnets – “Driving to a Poetry Reading in My Father-in-Law’s Pick-up Truck” (My Puerto Rican Past) and “Joseph Sr.” (Tough Guys Don’t Write). But to get back to that nagging question. Why Expecting Songbirds? It’s from a poem about his pre-school-age son, waiting for the return of the birds to their feeder, as winter melts into spring. So far no finches, juncos, titmice or cardinals, but the boy continues to wait. And Benevento?